A lot has happened in one short day. If you have read my previous emails, you probably remember me describing how crazy the moped riders are around here. Well, I now have lots of first hand experience. My new friend, Bowo, the cook at the restaurant, owns a moped (125cc) and has been taking me around the town on the back of his bike to see the sights. Actually, once you are on the bike and weaving in and out of traffic, it doesn’t seem so bad. Going along at 80km/h feels great after all the heat. I question the value of the cheap little plastic helmets that everyone wears for protection. It’s a false sense of security since I’m sure they wouldn’t do much in an accident except maybe hold all the pieces of your head together. Bowo took me to see the ancient temples of Borobudur and Prambanan. They are both on the UNESCO list of World Heritage sites. 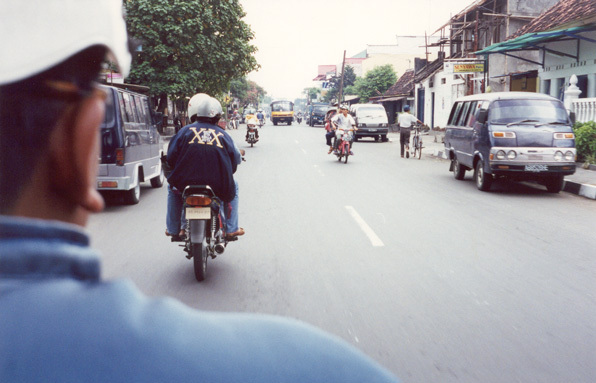 Each is located about an hour outside of Yogyakarta. We left for Borobudur at 5:30 a.m. to avoid the crowds and rain. When we arrived, they were just letting people in. It is difficult to describe the enormity of this monument. It truly Is one of the seven wonders of the ancient world. It is probably the size of two football fields and is more like a square mountain. There are about 7 levels to the monument with the first 4 levels each having hundreds of carved stone relief of buddhist images. The fourth level has seated Buddhas all around the perimeter. The sixth level has what almost looks like 60 perforated bells about the size of a Volkswagen each with a seated Buddha within. You can look through the large gaps in the stone and see them inside. One has been left open so the Buddha can be seen. The seventh level has a huge bell shaped dome in the very middle. It’s much more impressive than I can ever put into words and I know each of the elements on the monument have very specific names but I cant recall them at this moment. I read the history about it very quickly last night, but it didn’t really make any sense until I got there and saw it. 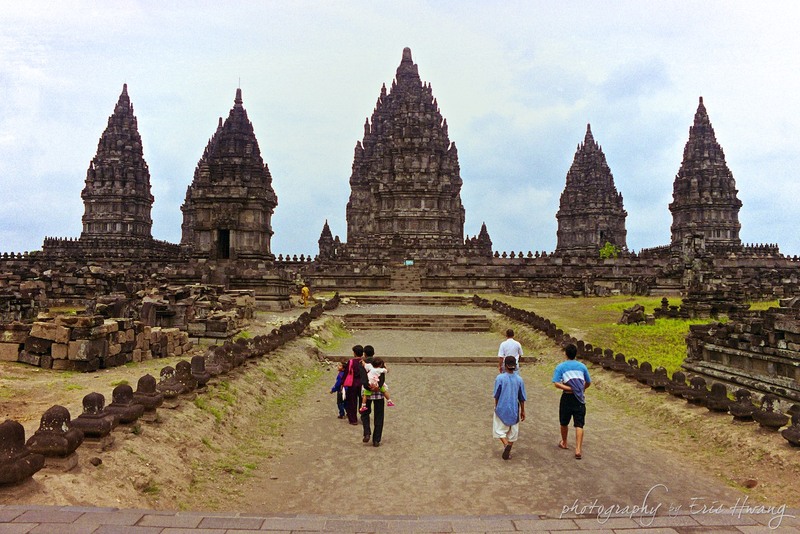 Prambanan is actually several different temples but I only had time to visit the largest and most prominent one. These temples are Hindu and were erected for the various figures of their religion. I wish 1 had my guide book with me so i could get the background on these places, but of course it’s back at the hotel room. The temple I saw actually consisted of 9 temples ranging in size from about 100 meters tall to nearly 900 meters all within an area about the size of a football field. Each had steep steps and a chamber inside with some Hindu deity. They reminded me of the fronts of European gothic churches with all the pointy spires and ornate carvings. Both these places were peaceful and relaxing; full of reverence. But once you left the fenced area of the temple or monument itself, you are swarmed with street vendors selling everything from water to small stone replicas of where you’re at and every imaginable thing in between. It kind of ruins the experience having some guy hounding you to buy postcards for the entire walk back to the parking lot. Just part of the experience I suppose. Seeing all these tourist sights was inspiring and I took a lot of pictures, but the best thing I saw all day was where my friend, Bowo, lives. Staying with Don exposed me to the top 2% of Indonesians. Bowo represented the , lower 98% of the population. He lives about 15km outside of town in the middle of rice fields. His wife and 3 y.o. child are very beautiful in a simple kind of way. They live in what you and I would consider a shack on a plot of land about 40 x 200 ft. His house is made of wood, bamboo and reed. The entire house is about the size of a large bedroom. He still has no electricity, no running water, just a well outside (with a bucket and pulley even), and no toilet The interior is very spartan with nearly matchstick-like furniture. Outside he has six chickens, a big pile of brick and stone which he proudly says he will build his next house with. Despite such primitive surroundings, he and his family appeared very happy. And as always, they were very hospitable, bringing hot tea and cookies for me, the honored guest. He manages to save part of the salary he makes to afford to start building his dream house. I didn’t want to appear rude, but I did take a few pictures of him and his family and his house. We later went to visit his parents and siblings who live just down the street, and they were equally friendly and accommodating. Many people could take a lesson from Bowo and simply enjoy what you have. I felt very honored that he would choose to share his life with me in this way. Well, I’ve run up enough time for one night. Tomorrow morning I leave for Bali. I’ll write more later.